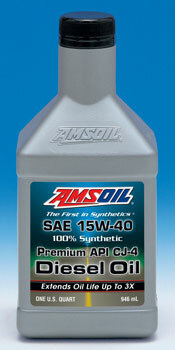 AMSOIL Synthetic 15W-40 Diesel Oil (DME) is the premium choice for API CJ-4 emission-quality diesel oil required by model-year 2007 and newer diesel engines. It delivers extraordinary lubrication in diesel engines found in commercial, fleet and personal vehicles. Built with the latest additive and synthetic base oil technology, AMSOIL Premium Synthetic 15W-40 Diesel Oil exceeds the higher performance demands of modern engines. It withstands the stress of heat, soot and acids to help prevent deposits, corrosion and wear. AMSOIL, the leader in automotive synthetic lubrication, produced the worlds first API-qualified synthetic motor oil in 1972. Trust the extensive experience of AMSOIL, The First in Synthetics,® to do the best job protecting your engine. 2007-2009 Caterpillar C13 and C15 on-highway engines must follow OEM-recommended drain interval. *Operating conditions and drain intervals for normal and severe service are defined by the OEM. Refer to your owners manual. This product is not expected to cause health concerns when used for the intended application and according to the recommendations in the Material Safety Data Sheet (MSDS). An MSDS is available via the Internet at www.amsoil.com or upon request at (715) 392-7101. Keep Out of Reach of Children. Dont pollute. Return used oil to collection centers.